Why Do Journalists Take Delusional Presidential Candidates So Seriously? 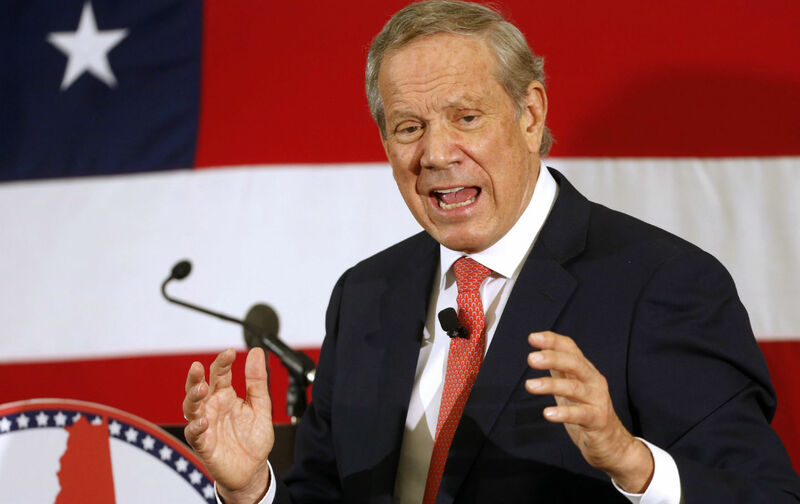 George Pataki’s campaign is a figment of his imagination. But that didn’t stop the press from covering it as if it were the real thing. With roughly 16 months to go before the 2016 presidential election, it has already become clear that the long trend toward increasingly worse election coverage is not about to be interrupted. The primary problem—and I am already sick of saying this—is the inability of mainstream-media professionals to acknowledge the dominant role that unrestricted bribery plays in shaping our political discourse. Making matters worse is the related problem of a Republican Party in thrall to a series of postures determined, on the one hand, by its super-wealthy funders and, on the other, by the ignorant superstitions of its fundamentalist base. But there is a third problem at the center of our political universe: that of voluntary journalistic stupidity. It’s not that the journalists are stupid. It’s that they believe they must pretend to be stupid in the service of a single narrative designed to last only until the next one replaces it—sometimes in a matter of minutes. A perfect example of this phenomenon—call it the Politico-ization of our politics—was the respectful coverage accorded the recent announcement of George Pataki’s campaign for president. Polling at 0 percent at the time of his announcement (well behind “none of the above,” which is no small feat in a field of nearly 20 candidates), Pataki is no more likely to play a meaningful role in the nomination process than I am. He has not held public office since declining to stand for reelection as Governor of New York in 2006. Since then, he appears to have been doing nothing much save toying with the delusional notion of a presidential campaign. As Washington Post reporter David Fahrenthold noted, “This January on ‘Jeopardy,’ three contestants were shown a photo of Pataki’s face—but none could remember his name. Last month, when he shook hands with patrons in a New Hampshire Chipotle, many said afterward that they had no idea who he was” (and no, he was not wearing dark sunglasses à la Hillary). Everything about Pataki’s campaign is ridiculous except where it is nonexistent. He gives no evidence of a significant organization, backers, or financial support. You can’t even tell who he is in the announcement photograph he released. And yet as soon as Politico broke the nonstory of his announcement, virtually every news organization covered it. (The Wall Street Journal even sent out a “news alert.” It should have been a “missing person’s report.”) The award for the most egregious coverage goes to The New York Times for carrying at least 20 stories mentioning Pataki on its website, with a significant percentage focusing on his candidacy as if it were a real thing. This is journalism on intellectual autopilot. A few reporters took the opportunity to explore the genuine issue that The Wall Street Journal posed in its pretend-serious May 31 article, titled “Can the GOP Accept a Pro-Choice, Gun-Regulating Centrist?” Certainly the paper’s editorial page could not, nor could the funders and fundamentalists who control the party. So how and why did this happen? After all, Pataki’s positions on abortion and gun control are majority ones, the latter by a landslide. And yet if such beliefs leave a Republican candidate dead on arrival, might that indicate something worth investigating? The Times’s Jim Dwyer—who is a metro columnist, and does not regularly drink the Kool-Aid that turns so many national political reporters into morons—demonstrated some rare good sense about how to cover the announcement. Even when Pataki was flying high after beating liberal hero Mario Cuomo in deep-blue New York, Dwyer pointed out, he was barred from speaking at the 1996 Republican National Convention, lest anyone notice that its platform called for the denial of citizenship (and therefore possible deportation) to people who were, like the governor, the descendants of undocumented immigrants. Pataki’s pathetic plea for attention could easily have been ignored. The Providence Journal, for instance, all but disregarded the presidential campaign announcement of Lincoln Chafee, Rhode Island’s former governor and senator, who spent most of his career as a Republican. According to Politico, Chafee’s “hometown paper has offered nothing more than wire reports and a stinging editorial suggesting that his bid will give Rhode Island a bad name.” Unlike Bernie Sanders—there will be more about his campaign in a future column—and even Martin O’Malley, Chafee will not affect the Democratic race in any meaningful fashion. Even so, insiders rushed to find a nefarious motive for this unusual outbreak of journalistic common sense. It is a key rule among media columnists that, however awful the coverage may appear, it can always get worse. The Washington Examiner’s Byron York recently wrote a column called “Taking Donald Trump Seriously,” in which he complained that “not a single national political reporter or analyst in Washington, New York, or anywhere else thinks Trump is a serious candidate.” Of course, York also felt forced to recognize that even Donald Trump has trouble taking Donald Trump seriously, what with his “apparently stream-of-consciousness talk” at Republican events. But never mind that. Not even the obvious idiocy of a lunatic like Trump can stand in the way of today’s journalistic professionals, who are on a mission to portray the Republican Party as a responsible one, and reality a mere inconvenience. Editor’s note: An earlier version of this article stated that George Pataki lost the 2006 gubernatorial election. In fact, he declined to stand for reelection. The text has been corrected.